I am a man of many interests. I love science. I love art. I love working with people. I love working with my hands. There are very few careers that would allow me to pursue all four of those interests. Dentistry is one of them. It is awonderful thing. Did you take any gap years, and if so what did you do during that time? After graduating from Boston University, I worked as a dental assistant in apediatric clinic for two years. I worked with five dentists, each from adifferent part of the world, each with his/her own approach to patient care and restorative dentistry. I learned a lot working at that clinic but, more importantly, I made several life-long friends. How did you prepare for the DAT? I cannot speak highly enough of Chad's Videos. I watched his videos to review important concepts for general and organic chemistry. I read the 3rd Addition of AP Cliffs Bio to review biology. After establishing a strong foundation in those three areas, I used DAT Bootcamp, Destroyer and the practice questions posted on Chad's to solidify my knowledge. These sources were excellent for me but the truth is there are many effective websites, booklets, practice tests, etc. to choose from when studying for this test. What is more important is that you are willing to commit the time and effort to get the most out of whichever material you do choose. What would you say your interview was like at BU? My interview at BU was a breath of fresh air. So much so that I feel strange referring to it as an "interview." It was more of a conversation and a great conversation at that. The faculty member and I spoke at length about life, food, the city, etc. At no point did it feel like a test, nor did it ever stoop to that awkward we-are-stuck-in-a-room-together-so-let's-talk type of small talk. In retrospect, that conversation was highly reflective of this university as awhole. I know its been said before and it will be said again but professors, clinical instructors and students at this school really do treat each other like family. 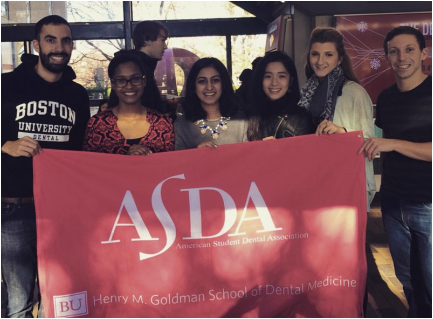 How would you describe your dental school experience at BU so far? I wanted a career where I felt that my passion of life long learning and philanthropy could be married. Given the ever growing dental field, I truly believe that I will be as thrilled and challenged when I am 30 years into my career as I am now. My ultimate goal would be to work in practice, while constantly planning either domestic or international dental outreach trips. I want nothing more than to give back to the community who allowed me to pursue my dreams! I know that the general public can have their fears, so I would love to hopefully be a dental professional that fosters a comfortable and positive environment. Putting more genuine (healthy) smiles into the world sounds like a pretty great life pursuit. I enrolled myself in a Kaplan DAT preparation course during the summer before my senior year of college. I felt that the online class would help structure the studying into more manageable chunks and keep me focused on my areas of weakness. I studied for a few hours each day and completed the Kaplan homework along the way. I graduated from college in 2014 and immediately pursued an additional degree. I completed my Master of Science in Oral Health Sciences in May 2015 and then entered dental school as part of the class of 2019. Did you work, volunteer, or do any extracurricular activities before dental school? Throughout college, I constantly had a job. I wanted a little bit of spending money and also was refreshed by allowing my brain to take abreak from all the hard sciences. I volunteered at a local pediatric dental clinic and went on to eventually complete a semester long internship with the office. I loved being able to truly see how asuccessful office functions. During college, I participated in Greek life, Student Government, and Pre-Dental Society. Research wasn't an area I was terribly interested in, so I felt that my time was better devoted to something that did peak my interest. My rationale was that I would rather have invested my time in volunteering because I felt more passionately about giving back. My interview was amazing. It felt more like a conversation than anything else. I was excited to talk about all of my experiences that led me to dentistry and what I hoped to see in my future. I felt like my interviewer took a genuine interest in the individual that I am rather than assessing whether I was an applicant that 'checked off all the right boxes.' The day itself was filled with nerves, but the faculty and students at the school were incredibly welcoming and warm. I took the online Kaplan course to study for the DAT. I found it very useful for studying. It provided me with structured schedule and went through each section separately so I did not miss anything. They gave out homework and readings to do so that you stayed on top of the material and did not fall behind. It was expensive but I believe it truly helped me to pass the DAT. My scores improved by over 8 points from my baseline at the beginning of the course to the real exam. I did research for two years in undergrad under Dr. R Craig Albertson at UMass Amherst. His lab specializes in craniofacial diversity, integration, and plasticity specifically in African Cichlid fish. My main role was to dissect the fish, image them, and provide morphometric shape analyses on each fish. My interview at BU was by far the most relaxed interview I had. The interviewer had already reviewed my file beforehand and wanted to have acasual conversation to get to know me better. It is important to remember that the interview is just as vital for the school because they want to make sure you would be a good fit for their program. Did you shadow before applying to dental schools? I shadowed my pediatric dentist for two summers before entering dental school. I worked with him for 2-3 days a week and only did half days. He allowed me to work alongside him to assist and interact with patients which helped to strengthen my passion for dentistry. What advice would you give applicants or those considering dental school? Keep up your grades in undergrad or a masters program, make sure to do volunteering and extracurricular activities, and don't get so hung up on scores and numbers. People will tell you that GPA and DAT scores are the most important aspects of a dental school application. They are very important -- however, everyone gets in to dental school for a different reason. With that being said, make sure to try your hardest but realize that being well rounded (having extracurriculars, volunteering, research, a good personal statement) will make you the strongest applicant that you can be. I was interested in dentistry because it’s a unique profession where I can work with my hands and help people. It’s among one of the few professions where a person could come in in a huge amount of pain and leave feeling 100 times better. Both of these contributed to my desire to pursue dentistry. I prepared by using the Kaplan review book and using Crack the DAT for the entire summer before I took the exam. There are many other review materials out there that others have used which could be better for reviewing certain sections. I did take a year between undergrad and dental school in which I got a masters degree. I think it was useful for learning how to deal with the massive amount of studying that is required in dental school. I did a lot of volunteering with my school’s pre-dental club which also let me connect with dentist around my school and with current dental students to learn as much as I could about dentistry before starting. I did a little amount of research in undergrad but have not continued that research in dental school. It was very conversational and relaxed, everyone was really nice which contributed to me wanting to attend BU. Yes I shadowed before applying, I think it’s a requirement for this profession because if you don’t know what you are getting yourself into you might regret your decision later, plus it gives you an idea of what life is like after school. Did you move to a new city for dental school? If so, what helped that transition? Yes, I moved to Boston from Colorado. The transition was not too bad because I had moved around some earlier in my life which meant that I didn’t feel like it was that big of a deal moving to Boston. You will make a lot of new friends that will help with that transition plus being excited about being in dental school will also help. First, relax, this is a long process and freaking out the entire time is going to make your hair turn white. Second, make sure that this is actually what you want to do, either by shadowing or any way you can, this is an incredibly long and hard process and not wanting to ultimately do this for a career will make you miserable.